Bhola is a very poor island in the Ganges Delta in Bangladesh with major environmental, social and health problems. The name Bhola means “forgotten place”. Because of the rising sea and land erosion the shape and size of Bhola is in constant flux, so the following figures are very approximate. The island is around 95 kms long by an average of 35 kms wide, some 3,400 sq kms in total (about the size of Wiltshire). According to the last census in 2001, the population of Bhola then was around 1.7 million. This was made up of 329,000 households in 461 villages and 5 main towns – 486 people per sq kms (four times the density of Wiltshire). Since 2001 the population has grown and the land shrunk, and in the rainy season much of the land is under water. So, the population density today on the habitable land is at least ten times that of Wiltshire. In Bangladesh two of the mightiest rivers in the world – the Ganges (2,500 km) and the Brahmaputra (2,900 km) – merge and divide forming the Ganges Delta. Both rivers change their names several times over their courses. From where the main streams of both rivers merge the combined river is called the Padma. Then when it is joined by the Meghna (the second stream of the Brahmaputra) it acquires that name as it flows past the island of Bhola and empties into the Bay of Bengal. Access to Bhola is by launch (for passengers) or ferry (for vehicles) or by the one and only seaplane run by Mission Aviation Fellowship (www.mafbangladesh.org). 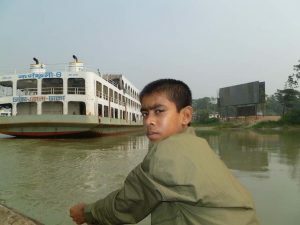 The crossing from the city of Barisal, west of Bhola, is relatively short but Barisal is the wrong side of the Ganges/Padma for travel to or from the capital Dhaka to the north or the second city Chittagong in the east. With the river channels constantly shifting the only bridge over the Ganges in Bangladesh is in the northwest, so launches are the most direct means of getting to most places. Two launches run every night between Bhola and Dhaka, taking between 8 and 12 hours depending on tides, flood and fog. Launch journeys in Bangladesh can be perilous. Overcrowding, poor maintenance and disregard of safety standards add to the risks of river waters which are particularly dangerous when swollen by the annual monsoon. In 2002 the MV Nasruddin sank near Chandpur north of Bhola killing some 450 followed by the MV Nasrin in 2003 with the loss of 400 lives. Bhola is a fertile, low-lying island with an economy based on agriculture and fishing. It is the largest of the river islands and like all of Bangladesh is densely populated. The monsoon season runs from May to October and the cyclone seasons are April–May and September–November. 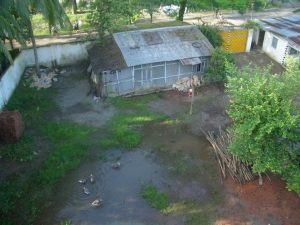 In 2007 and again in 2010 the monsoon has been particularly heavy causing extensive flooding on Bhola. Being at the confluence of two mighty rivers and the even more mighty sea, Bhola is at the mercy of a combination of manmade and natural environmental forces, which is becoming increasingly destructive. Prior to 1960 erosion was not a problem for Bhola. But since then rising sea levels have dramatically reshaped Bhola. Firstly, the rising sea has directly encroached on the coastline. Secondly and far worse, the rising sea level has changed the river currents which now flow more strongly past Bhola. Already as much as half the island as it was in 1960 has been washed away, together with the homes of 500,000 people. But the island is growing longer as some of the land washed away from the North and sides of the island is deposited in the South. All the indications are that the sea level in the Bay of Bengal will continue to rise implying that the erosion will, if anything, accelerate. Glaciers melting because of global warming, changing agricultural and water management practices in northern India and more severe monsoons have all increased the risk of flooding. Perhaps more so further upriver than at Bhola. But Bhola is in the frontline when cyclones reach the coast and these seem to have become more destructive in recent years. The river pollution is all too evident just north of Bhola near Chandpur. Here the relatively clean clear waters of the Meghna join the murky waters of the Ganges/Padma, which serves as the human, animal and industrial sewer for northern India. At that point the two streams can be seen flowing side by side for a while without mingling. When the river floods on Bhola the land is polluted. But all the time the fish are being polluted. As the sea level rises, salt water penetrates further upriver. So the water around Bhola is becoming more saline which affects the types of fish that can live there. Cyclones cause sea surges which drive salt water inland, poisoning what was previously good agricultural land and contaminating wells and other water resources. 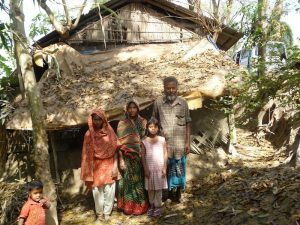 Bangladesh is one of the poorest countries in the world and Bhola is one of the poorer parts of Bangladesh. It is a subsistence-level agricultural and fishing society. 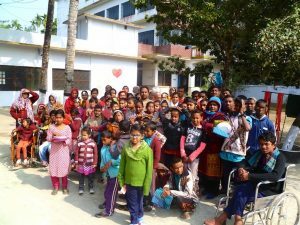 As an island people the Bholaya are used to being self-sufficient – they need to be because Bhola is indeed the “forgotten place” getting little help from the central government. They are a gentle people and, given half a chance, very caring. However, the literacy rate is low – 37 per cent at the time of the census in 2001– so the knowledge and understanding required to provide effective care are in short supply. Most Bholaya live in shacks made of tin, bamboo and wood. These offer little protection in a cyclone but they are at least easy to dismantle and reassemble when erosion forces the family to move. Bhola had a population of 1.8 million in 2014. The general trend has been for the population to rise as fast as elsewhere in Bangladesh mainly due to the high birthrate. 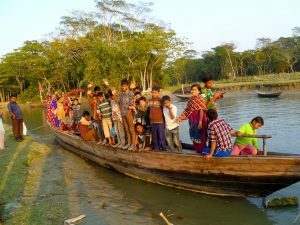 In addition there is inward migration drawn by the abundant river and sea fishing around Bhola and the fertile soil (until erosion became a problem). But now there is also emigration as some of those who have been made repeatedly homeless as the island shrinks have decided their only option is to leave. Tragically those who leave often end up on the streets of Dhaka which are already full of refugees displaced by erosion in other parts of Bangladesh. There is an unusually high proportion of orphaned children on Bhola. Some parents are lost at sea or die in the floods and cyclones. Others die from illnesses and injuries which go untreated because of the lack of medical facilities on the island or because shame, local custom and medical ignorance prevent them seeking the help they need. The Bholaya speak Bangla. Almost 90% are Muslim, 10% are Hindu and there are a few Christians. Many Hindus left Bhola and went to Calcutta in India at the time of partition in 1947. Since 1971 the remaining Hindus have lived at peace with the Muslim majority. Even poor Bholaya usually eat fish and a little meat. So they tend to have a better balanced diet than poor people in the North of Bangladesh where the diet relies very heavily on rice. 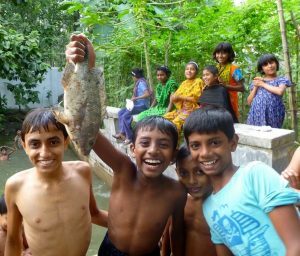 But the fish, such as the very bony but tasty hilsa, swim in polluted waters, which is not good for the fishers or the eaters. And the price of rice, much of it imported, is still critical for them: it can fluctuate dramatically in the wake of natural disasters; most recently both harvests failed in 2017 compounded by the influx of Rohingya refugees. Poverty and lack of education means there is a lot of ignorance about even basic medical matters and preventative healthcare. Medical help on the island is very limited. The nearest modern government hospitals are in the capital Dhaka and Barisal on the mainland. Spending the night on the open decks of the ferries often results in those already sick catching colds or worse. Many simply cannot afford the boat fare. The combination of poverty, pollution and lack of medical care results in many children on Bhola being born with disabilities and/or losing their parents at an early age. Other consequences of the land erosion are a spate of legal disputes about land and the usual social stresses when displaced people move into an already crowded area. Displacement also breaks up families if the breadwinner has to go elsewhere to look for work. 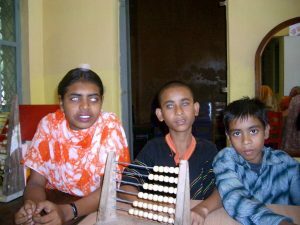 Bhola has a high rate of children born with disabilities. Cleft lips and/or palates, club feet, blindness, deafness, cerebral palsy and other mental disabilities are all common. Blindness is often caused by the disease river blindness, which is curable if caught in time and the necessary medicine is provided. Burns are another all too common cause of disablement or of death leading to orphanhood for the children. Of course, it is mainly the mothers and daughters who suffer the burns from oil lamps and stoves and, most tragic of all, the acid burns. Poverty, social custom, environmental pollution and the lack of medical care, in particular during pregnancy and at the time of birth, are all contributory factors to the high rate of disability. The first tragedy is that the pollution and other environmental problems are mainly the result of causes arising thousands of miles away and entirely outside Bhola’s control. It does not matter to Bhola whether it is global warming that is driving climate change, whether the causes are manmade and whether they are reversible. They simply need help coping with the consequences as they occur. · Marriage to a first cousin is common. · Also marrying and getting pregnant too young. · By custom it is the man who takes all the decisions at the birth. If problems arise and the man does not seek help, or does not do so soon enough (it might involve carrying his wife to the clinic), the baby may suffer brain damage, for example, leading to cerebral palsy.